Back in 2014 Mcqueen’s fall collection featured a now well known, and well pinned gown, which encapsulated something entirely magical and otherworldly. 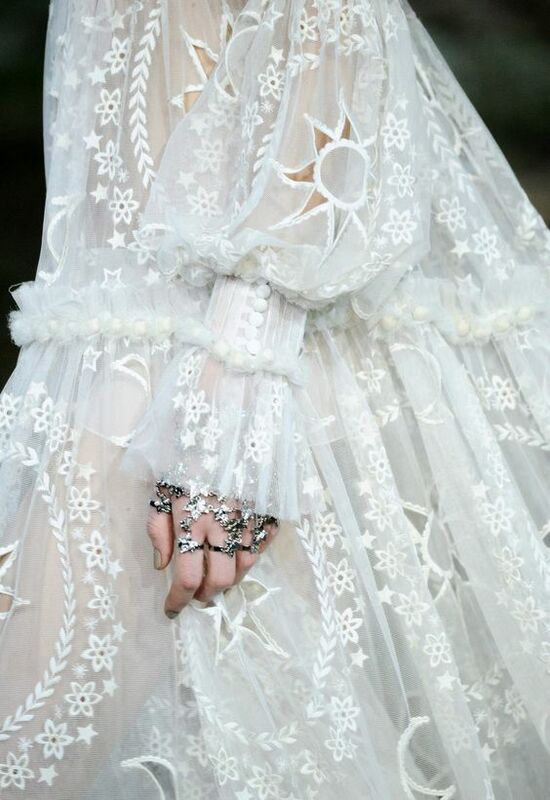 The divine combination of the moon, stars, and sun, with the lightweight ethereal fabric was sublime. It must have been something of a prophecy, fast forward a few years and numerous designers have since been conjuring up magical creations. Valentino’s Spring 2015 collection featured star emblazoned dresses, at Dior SS17 tulle dresses were adorned with tarot card symbols, and mostly recently Attico wowed with their decadent star encrusted gown. Scroll through my selection of dresses and shoes below which will leave you feeling starry eyed. On a side note I love M'oda Operandi's bridal offering, they have some incredible dresses for all budgets at the moment. Also this star embroidered fabric from Etsy would make a beautiful veil.